A stripped-down, frank discussion of all things food. 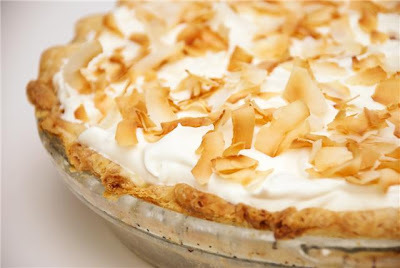 I almost closed the book on our Easter dinner without mentioning the elected dessert: coconut cream pie. Using the same vein of thinking as the main course, I wanted traditional elements present without having to buy a lamb-shaped cake pan. Plus, quite honestly, I barely need an excuse to make custard. This is an adaptation of my mom’s recipe: a classic blind-baked crust filled with an eggy, not-too-sweet coconut custard, topped with soft whipped cream and toasted coconut shavings. A happy ending indeed. Thanks for another fantastic photo, Talley! Most classic recipes call for sweetened, flaked coconut but I find it to be excessive. If you can’t find large shavings for the garnish, just toast some regular shredded coconut. In the work bowl of a food processor, pulse the flour, salt and sugar to combine. Add the chilled butter and pulse until the mixture resembles small peas. Add ice water, beginning with 2 tablespoons, and pulse until mixture just comes together (pinch some dough to see if it holds – if not, add more water). Gather dough into a ball, press into a disc and wrap in plastic. Allow to rest in the refrigerator for at least 30 minutes. Place dough on a lightly floured work surface and, using a rolling pin, roll out into a 12-inch circle, about 1/8-inch thick. Be sure to check if the dough is sticking – you may have to periodically sprinkle a bit more flour underneath. Transfer rolled dough into a 9-inch pie plate. Carefully and gently press the pie dough to line the bottom and sides of the plate. Fold any overhanging pieces under itself (so that it's double-so-thick) to create a thicker edge. Trim any excess. Flute edges using your thumb and forefingers or crimp with the tines of a fork. Chill 15-20 minutes before baking. Line the inside of the chilled crust with parchment paper and fill with pie weights, dried beans or rice. Transfer to the oven and bake 20 minutes or until edges are lightly golden. Remove the parchment paper and weights and return shell to the oven for another 10-15 minutes, or until bottom of crust is pale golden. Remove from oven and set aside to cool. Place sugar, cornstarch, salt, egg yolks and milk in a medium saucepan. Whisking constantly, cook over medium heat until mixture thickens and comes to a boil. Let boil for 1 minute. Remove from heat and add butter, vanilla and coconut; mix well. Let cool slightly; pour into baked pie crust shell. Spread coconut shavings into a single layer on a baking tray. Transfer to oven and toast until golden brown, about 6 minutes. Keep checking every few minutes since it goes fast! Set a side to cool. In a large mixing bowl, add whipping cream, sugar and vanilla. Using a hand mixer, beat on high speed until very soft peaks form. Spread over the coconut custard, using swirling motions to create beautiful peaks. Garnish with toasted coconut shavings. This brings me back to the first time I tasted your delectable cooking! 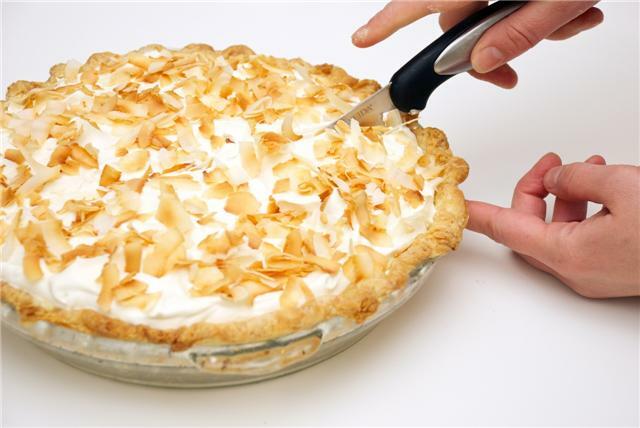 You made INDIVIDUAL coconut cream pies. Swoon, swoon, swoon.